The world of science is a multi-dimensional universe that’s difficult enough to grasp. Lucky for those of us who are not blessed with the ability to understating the theory of relativity, how to build a robot, or even what the sun is made out of, some smart musicians have done a great job of breaking down the stuff flying over our heads in science class. This list stays away from sci-fi (alien invasions or life after the apocalypse is not mentioned) and instead names songs whose science-based lyrics radiate and even manage to teach listeners a little something. This ‘80s one-hit-wonder gets better with each dramatic exclamation of “she blinded me with science!” This ultra-cheesy synth-pop track tells the story of the narrator’s infatuation with his teacher, Miss Sakamoto. Despite how much he thinks she’s beautiful, Miss Sakamoto does the right thing and fails him in biology and geometry, and finally hits him with technology that’s hopefully heavy. Breaking Bad fans will recognize this as Creepy Todd’s ringtone. Humorist/musician/professor Tom Lehrer bravely put the periodic table of elements to song, actually to the tune of “Major-General’s Song” from The Pirates of Penzance, in 1959. Naming all but one of the elements, “The Elements” is an incredibly difficult tongue twister but if you’re Daniel Radcliffe, reciting it doesn’t seem that hard. One of many science-inspired cuts from Andrew Bird’s 2007 record Armchair Apocrypha, “Imitosis” gets the spot because of this standout line: “despite what all his studies had shown, that’s what’s mistaken for closeness is just a case of mitosis.” As this lyric hints, “Imitosis” is a clever narrative about a professor trying to find out if there’s more to human behavior than just cells at work. “Natural Science” from Rush’s 1980 album Permanent Waves is broken up into three guitar wielding, typical Rush sounding sections: I. Tide Pools, II. Hyperspace, and III. Permanent Waves. In section I. lyricist Neil Peart starts at earth’s beginnings where eventually “all the busy little creatures chasing out their destinies, living in their pools, they soon forget about the sea.” Section II, “a quantum leap forward,” is a look at contemporary life, “a mechanized world, out of hand,” and section III looks to the future and Peart warns how powerful nature can be. Rush’s compact summary of life leaves a lot of room to fear the future. The tongue-tying, linguistic luminaries Blackalicious can give high school science teachers a run for their money. The hip-hop duo have a triumph in science inspired lyrics with “Chemical Calisthenics” thanks to verses like this: “C-O-H-O-2 wine water solution of calcium hydroxide. Slobbin it, C-A-O lime will make bleach powder. Galvanic metal beats stomp out louder. Dried ice, C-0 squared refrigerant.” Pull up a chair and learn a thing or two from Blackalicious. Nine days before the moon landing, David Bowie released “Space Oddity,” a song about a fictional astronaut, Major Tom. Though the technicalities of space travel are not explicitly named, listeners can read “Space Oddity” as being about a cool trip to space, a poignant look at relationships and feelings of isolation, or a song about drugs. 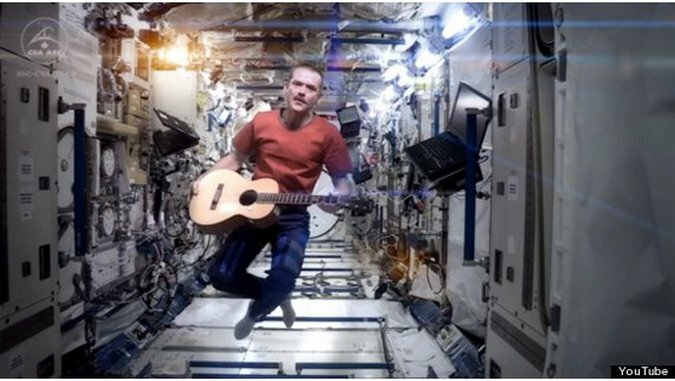 Either way, in 2013, Canadian astronaut Chris Hadfield gave us all a treat by filming himself singing “Space Oddity” while floating on the International Space Station. Six years after “Space Oddity” Elton John pens his own story about an astronaut. Similar to Bowie, John’s “Rocket Man” deals with the loneliness, helplessness, and isolation that many people, not just space travellers, feel at work. The lyrics, “and all this science I don’t understand. It’s just my job five days a week,” really drives this point home. The theme song of both the movie and television show of the same title, “Weird Science” (like “She Blinded Me With Science”) is filled with the futuristic sounds of ‘80s keyboards. Lyrically the song is pretty much a summary of the plot of the movie and television show in which a man makes a dream girl thanks to science! Lyrics aside, the danceable groove in this song is infectious which, thanks to the extended six-minute album version, is even more fun. Icelandic avant-garde queen Bjork has a bunch of songs with scientific lyrics that are often metaphors for a greater story at play. “Cosmogony,” from Biophilia, explores various creation myths about the universe. In the song’s final verse, Bjork takes a jab at the Big Bang theory by naming it a creation myth itself. Alt-rock band (and Malcolm in the Middle theme song creators) They Might Be Giants have found Grammy-winning success with their children’s albums. “Why Does the Sun Shine,” from the group’s the science themed third children’s’ album Here Comes Science, well, shines. Done in a light-hearted pop-punk style, “Why Does the Sun Shine” nicely balances kid-friendly lyrics like, “the sun is hot,” “the sun is large,” or “the sun is far away” with more advanced verses like, “the sun is mass of incandescent gas, a gigantic nuclear furnace, where hydrogen is built into helium at a temperature of millions of degrees,” for a great listen at any age. By auto-tuning the teachings of world renowned scientists, and adding in some light electronic work, John D. Boswell’s video series Symphony of Science is a thrill for science lovers. In the first entry of his epic project, Boswell (also known as melodysheep) uses clips from Sagan’s Cosmos: A Spacetime Odyssey series and Stephen Hawking’s Stephen Hawking’s Universe series to create a poetic and educational wonder. From Pink Floyd’s debut album The Piper at the Gates of Dawn, “Astronomy Domine” is an early showing of the band’s space rock tendencies. With Syd Barrett at the helm, “Astronomy Domine” is suitably psychedelic sounding and features lyrics like, “around the icy waters underground. Jupiter and Saturn, Oberon, Miranda and Titania. Neptune, Titan, Stars can frighten,” which are enough to thrust you into space.